LA JOLLA, CA–In the disease atherosclerosis, cholesterol-containing plaques form in vessel walls, causing arteries to narrow and greatly increasing the risk of heart attack and stroke. Currently, atherosclerosis is the number 1 killer worldwide, just ahead of cancer. Recent use of statin anti-cholesterol drugs has reduced cardiovascular events caused by atherosclerosis by 35%, but millions of individuals remain at risk. Hence, a desirable addition or alternative would be intervention to prevent plaque formation altogether. A new paper published in Circulation by researchers at La Jolla Institute for Allergy and Immunology supports this possibility. It reports successful vaccination of atherosclerotic mice with a small chunk of protein snipped out of "bad cholesterol." Vaccination reduced plaque levels in test mice, and other experiments with human blood samples identified the class of T cells likely responsible for positive outcomes. The paper suggests that a comparable strategy could form the basis of a human vaccine. "We knew atherosclerosis had an inflammatory component but until recently didn't have a way to counteract that," says senior author Klaus Ley, M.D., professor and head of LJI's Division of Inflammation Biology. "We now find that our vaccination actually decreases plaque burden by expanding a class of protective T cells that curb inflammation." So-called "bad cholesterol" is actually an amalgam of the lipid cholesterol carried on Low Density Lipoprotein, or "LDL". To create the new vaccine, Ley's team engineered a short stretch (or peptide) of the core LDL protein. They then undertook a type of molecular fishing expedition, using a version of the peptide mounted on a scaffold called a tetramer as bait, to identify what immune cells became active in its presence. To do that, the researchers obtained human blood from two groups–women with plaque accumulation in their carotid arteries versus women without plaque formation–and screened those samples for immune cells that latched onto the peptide. In both groups, the peptide bound to subset of CD4+ T cells known as T regulatory cells (or "Tregs"). 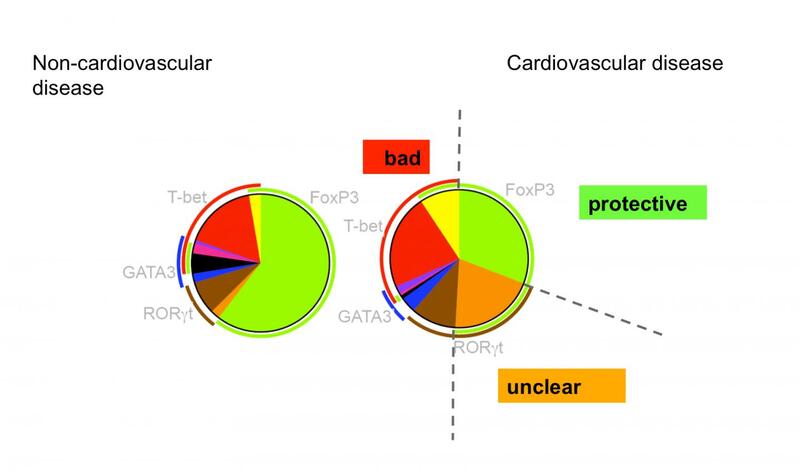 But the percentage of Tregs from atherosclerotic subjects was much smaller, and other types of T cells were much more common than in healthy donors, suggesting that the Tregs may undergo some kind of molecular switch that hampers their effectiveness once cardiovascular disease progresses. Beyond addressing a major health concern, this paper exemplifies next-generation vaccinology. The immunogenic component of most vaccines used today is a mix of molecules from killed or weakened pathogens, an approach not far from that used by Jenner to create a smallpox vaccine. Whole pathogen immunogens aren't applicable to non-infectious diseases, like atherosclerosis or cancer, and Ley says engineered vaccines are superseding them. "We are now engineering vaccines to be more specific," says Ley, citing the recently developed human papilloma virus (HPV) peptide vaccine against cervical cancer. "Once we can manipulate the immune response with a single peptide or epitope, we will be able to create more highly targeted vaccines with fewer non-specific responses." This paper is evidence that this goal is feasible against atherosclerosis, but in no way suggests that the estimated 25 million Americans now taking statins should discard their prescriptions. More work is needed to create a vaccine appropriate for human use. There is even hope that an atherosclerosis vaccine would still be effective in statin-treated subjects. But a preventative, not just a treatment like statins, is needed to block plaque deposition, because atherosclerosis can go undiagnosed. "Men in their 50's with apparently normal cholesterol may be at risk," says Ley, noting that seemingly healthy people occasionally suffer fatal heart attacks. "Only then their docs realize they had atherosclerotic disease." A widely available vaccine that prevented plaque formation would make that scenario a thing of the past. The study was funded primarily by the National Heart, Lung and Blood Institute of the National Institutes of Health. Takayuki Kimura, Kouji Kobiyama, Holger Winkels, Kevin Tse, Jacqueline Miller, Melanie Vassallo, Dennis Wolf, Christian Ryden, Marco Orecchioni, Thamotharampillai Dileepan, Marc K. Jenkins, Eddie A. James, William W. Kwok, David B. Hanna, Robert C. Kaplan, Howard D. Strickler, Helen G. Durkin, Seble G. Kassaye, Roksana Karim, Phyllis C. Tien, Alan L. Landay, Stephen J. Gange, John Sidney, Alessandro Sette and Klaus LeyRegulatory. CD4+ T Cells Recognize MHC-II-Restricted Peptide Epitopes of Apolipoprotein B. Circulation, 2018. The La Jolla Institute for Allergy and Immunology is dedicated to understanding the intricacies and power of the immune system so that we may apply that knowledge to promote human health and prevent a wide range of diseases. Since its founding in 1988 as an independent, nonprofit research organization, the Institute has made numerous advances leading toward its goal: life without disease.